Cut bread in half horizontally; remove center of bread, leaving 1- inch thick shell. In a small bowl, combine mayonnaise, pesto and lemon juice; spread mixture on cut surfaces of both halves. 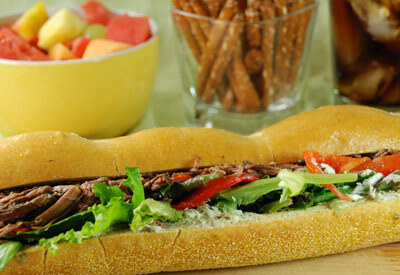 Layer cheese, salad greens, roasted peppers and roast beef over bottom half of bread. Season with pepper. Top with remaining half of bread. Cut into 6 wedges. Serve immediately. Note: Uncut sandwich may be tightly wrapped and refrigerated up to 2 hours. Cut into wedges to serve.